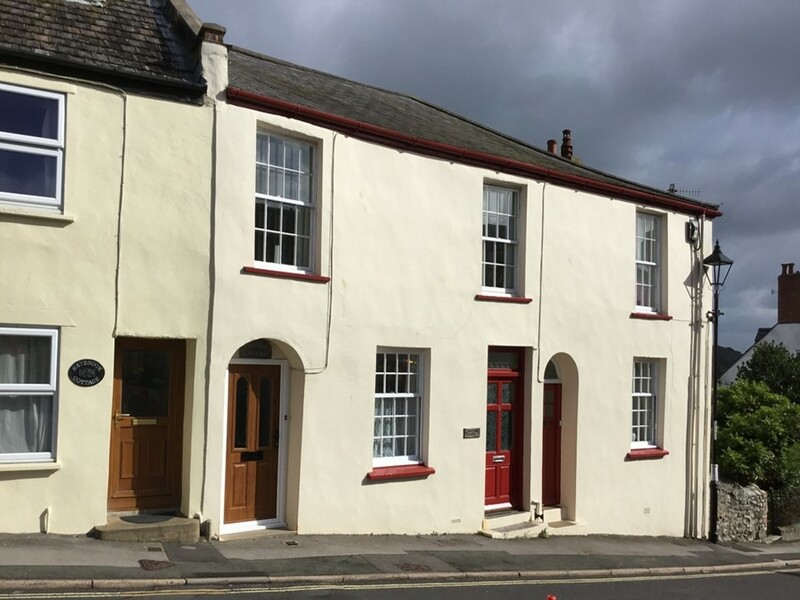 Scroll down to find out more about the Portland House, The Street, Charmouth. 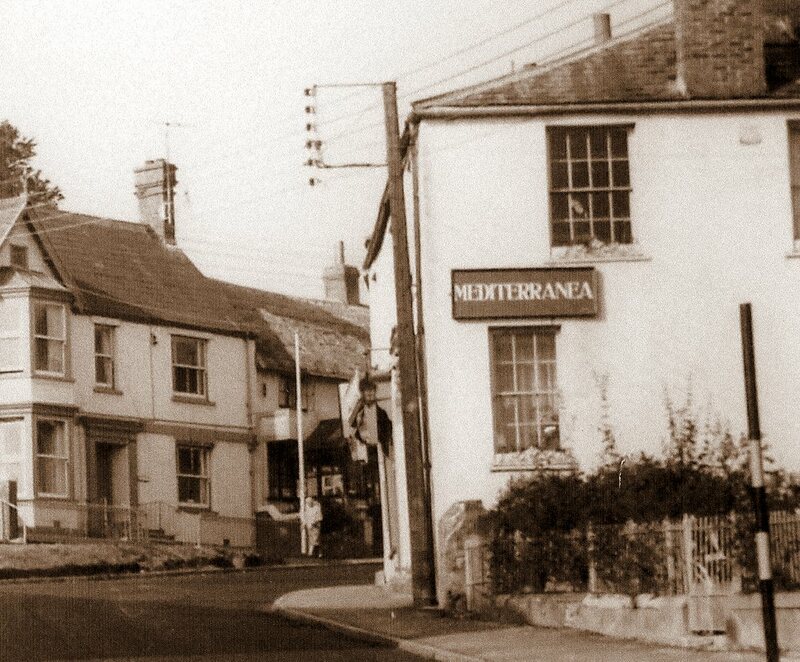 At the top of The Street opposite Charmouth House at the junction of Higher Sea Lane is a terrace of houses with a number of doors and windows. It is the first of these which is now called Garden Cottage and 1 and 2 Portland House that I wish to cover in this article. If you could go back in time this would have been one large thatched cottage which had been a village shop for over a hundred years.As with many properties on the north side of the street the plot of land which it stood on would have been one of the half acre burgages created between 1290 and 1297 when the Abbot of Forde at that time created a Borough here. The original stone wall still stands along the northern boundary along much of the length. 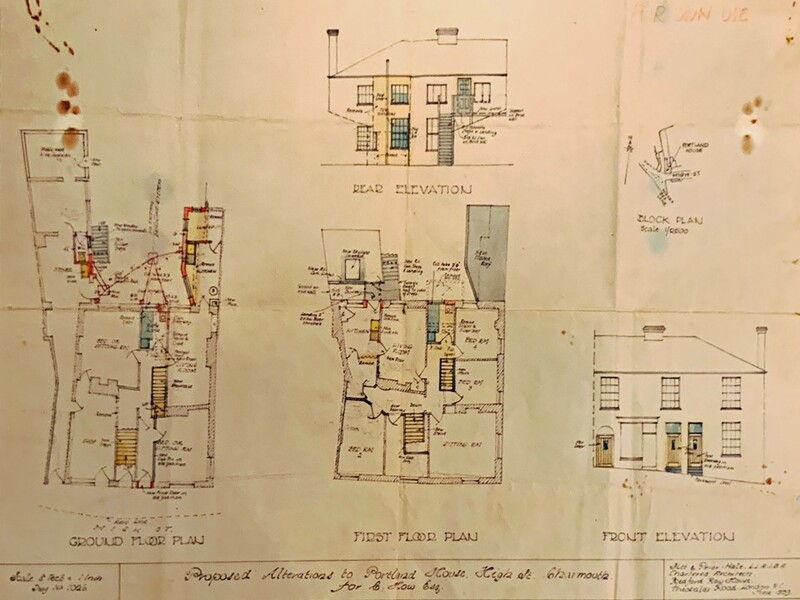 The plot on which Portland House is today has been subdivided over the years and would have no doubt included the land on which the adjoining Saybrook, Berwick and Bayville Cottages now stand on. 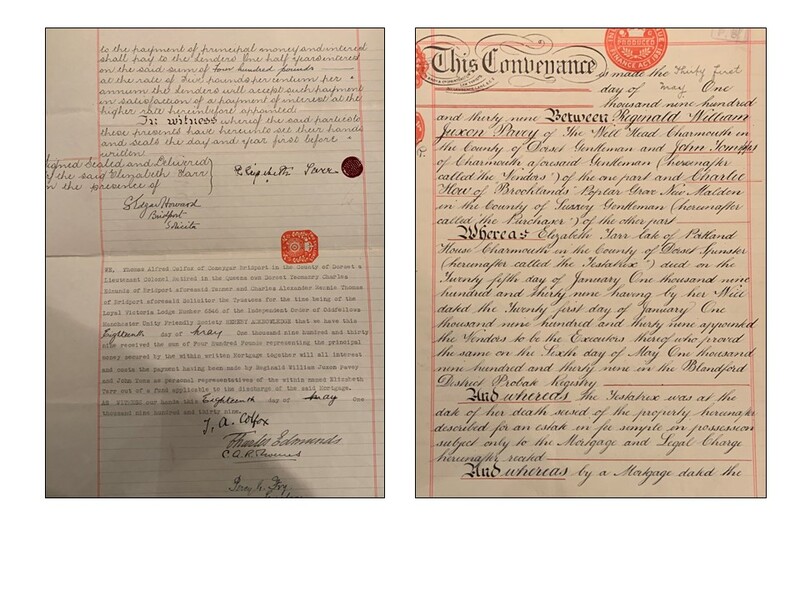 The owners of the next property above now known as Granville House have a set of deeds going back to the 17th century. A later deed of 1732 describes the house bounded to the north by lands belonging to Anthony Ellesdon, Lord of the manor who died in that year, and a cottage to the west occupied by Mary New and one to the east by Benjamin Paine. 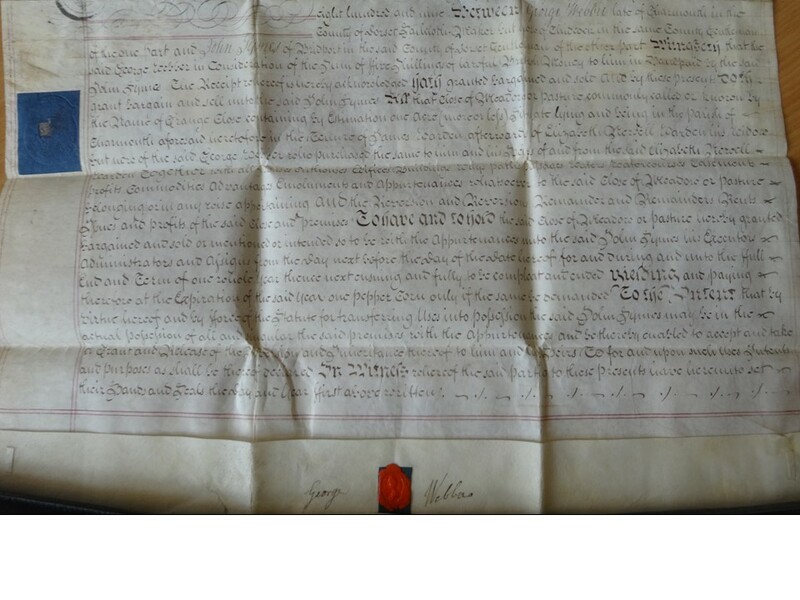 Another indenture dated 1814 again describes the boundaries as lands to the north formerly belonging to Benedicta Durston and afterwards of George Webber being a field called “Little Grange” whereon buildings were some time erected. It goes on to record a dwelling house of Benjamin Paine, deceased and afterwards of Willliam Hudd on the east. Granville House was at that time occupied by Benjamin Diment and John Hunter, his tenant. I found this information very important in tracing back the history of both Bayville cottage and Portland house as by checking the Poor Rates and Land Tax lists which are virtually complete for Charmouth from 1780 until 1832. Again, I was very fortunate to meet the present owners of Garden Cottage, David & Sheena Mandy, who are the proud possessors of the title deeds that go back to a large indenture in 1836. This was a revelation as within it was the following: "All that messuage dwelling or tenement with the orchard and garden thereunto belonging opposite to a dwelling house or Inn called the Fountain Inn formerly in the possession of John Anning”. 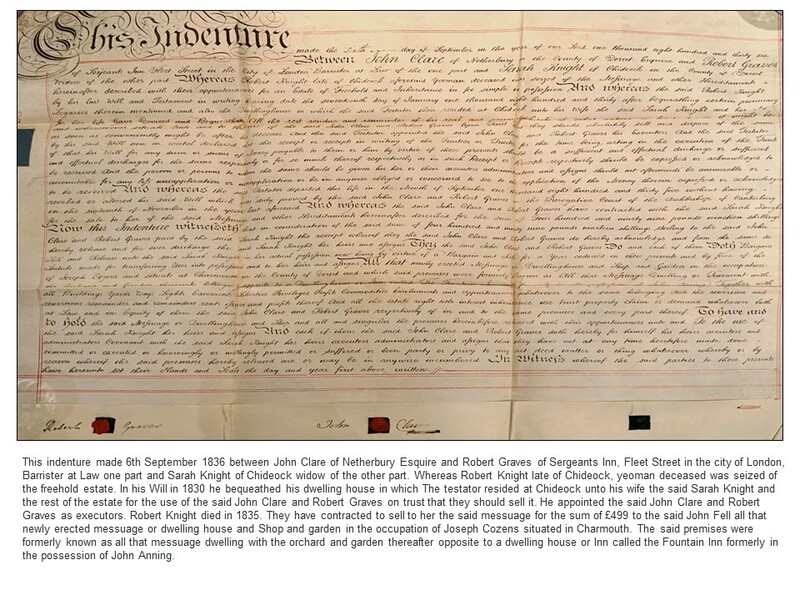 The record had to be before 1811 when Thomas Gordon bought the Inn and closed it soon after. 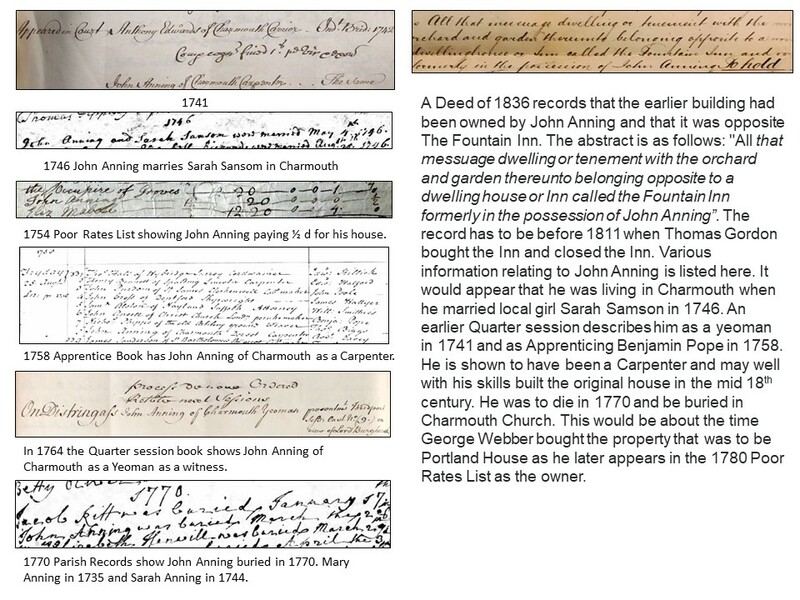 It would appear that John Anning was living in Charmouth when he married local girl, Sarah Samson in 1746. An earlier Quarter session describes him as a yeoman in 1741 and as Apprenticing Benjamin Pope in 1758. He was shown to have been a Carpenter and may well with his skills built the original house in the mid 18th century. He died in 1770 and was buried in Charmouth Church. 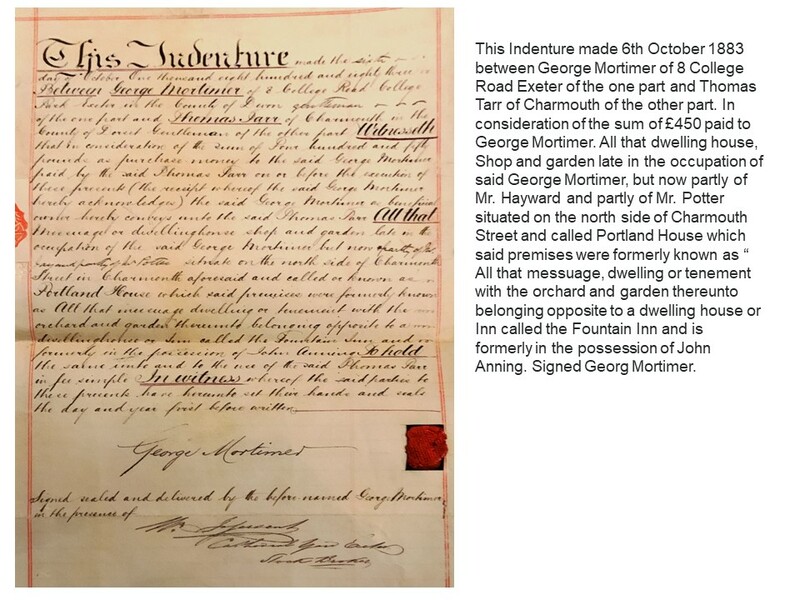 This would be about the time George Webber bought the property that was to be Portland House as he later appeared in the 1780 Land tax List as its owner. The rest of their Deeds helped fill in many of the gaps that eluded me as I only had limited information to go on before 1841 Census and Tithe Map. Both of these are invaluable as you can pinpoint with a degree of accuracy where villagers lived in that year. With censuses appearing every 10 years you get a snapshot which brings you up to 1911 when the last one was made available to the public. 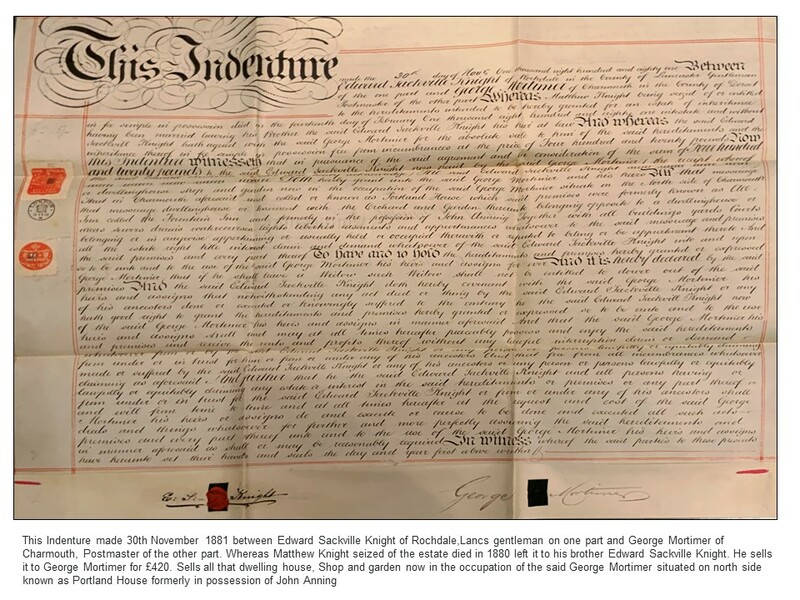 In the case of Portland House the 1841 Tithe Map reveals that it was number 71 and was owned by Sarah Knight and rented by Joseph Cozens. The plot of land behind it contained 22 perches and was bounded by the Monastic Wall. Sarah Knight also owned tithe numbers 76 (house, yard and gardens she rented to Joseph Dirk -18 perches) 77 (a field just over 1/2 acre rented by John Dirk again) and 153 (a house yard and field which was rented by Thomas Gordon) who lived in Charmouth House. She would have been 65 in that year living in a fine house on the Street in Chideock, with three of her six children. It was her late husband Robert who had inherited the properties on the death of George Webber’s wife, Sarah in 1816. The Webber’s were to have no children and George stipulated in his Will that his estate was to go to Robert Knight on the death of his wife. The family tree for the Knights/Webbers show that the two wives were related. 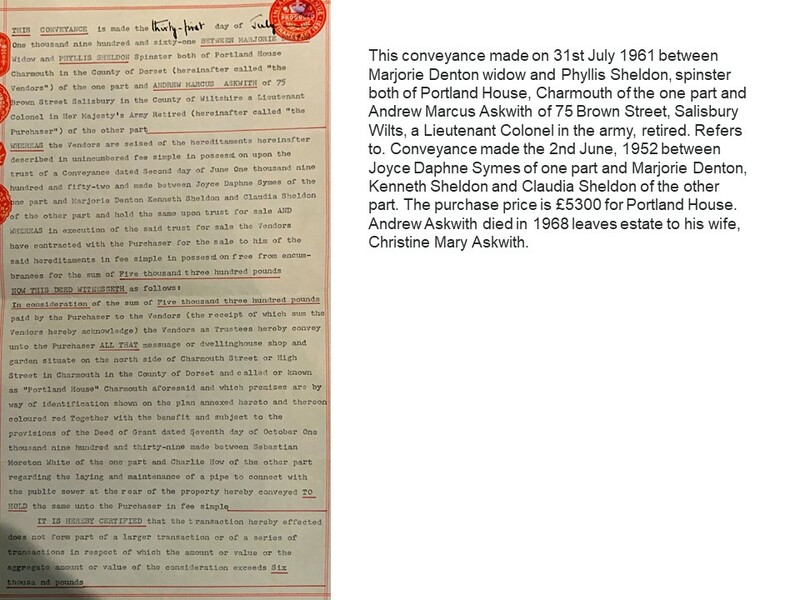 Sarah Knight and her children were to derive an income from Portland House until its sale in 1881. George Webber would have no doubt lived in Portland House with his wife after the death of John Anning in 1770. He also owned a house and field known as “Little Grange”, where Askew House stands and had a long lease on a field at the junction of Higher Sea Lane and the Street where “Knapp cottages” and the Council houses now stand. He operated a Sail Cloth Manufactory from here and would have employed a number of villagers. Flax was grown on fields around which was the staple that he would have used. There was a boom at the end of the 18th century for sail cloth as a result of the wars with America and France and it was centred on Bridport and the surrounding villages. He was born in Charmouth in 1742 and married Hope Palmer in 1772. She was sadly to die young in 1798 and he later remarried Sarah. Both Little Grange and Portland House were originally owned by the Lords of the Manor which was initially Forde Abbey until 1539 and the dissolution. The Webber’s had long lived in the village and a Poor Rates list for 1754 has Anthony Edwards Leasing a house described as “Webber’s”. In 1783 Richard Phipps Henvill commissioned a detailed map of the village by Upjohn of Shaftesbury. Unfortunately, the map has been lost, but the accompanying record book was copied by the famous historian George Pavey and from it we can see that George had a house and orchard with an area of 33 roods in that year and was to increase his holdings by the time of his death in 1810. To be disposed of in Charmouth, Dorset. A delightful Watering place on the high road from London to Exeter. An Old Established Shop with the business of a Linen Draper and Grocer, connected with a Lodging House, which has a separate entrance, and consists of a Dining and Drawing rooms, a 5 bed rooms, and good Kitchen. A walled Garden adjoins the House. To young beginners this affords a valuable opportunity, as the coming in will be made easy. The purchaser is to take the Shop Goods and Fixtures at a fair valuation. Immediate possession if required. Apply to J. Cozens, Charmouth. 1844 April 6th Taunton Courier. Edward Lamb answers the advert and takes on the business as both Grocer and Draper. 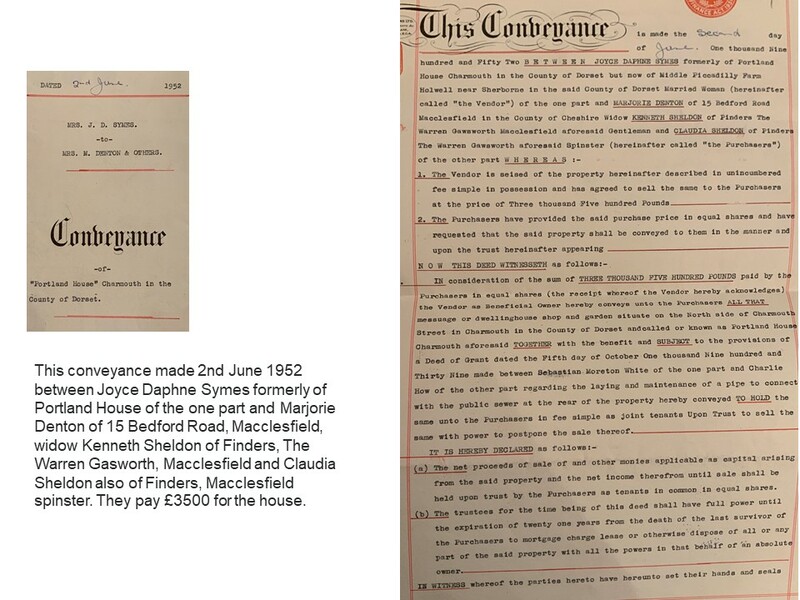 The 1851 census shows him, aged 51, living in the house with his wife Sarah aged 50 and his sister in law Caroline Payne aged 45 who is a shop assistant. An Advert was published in the “Beauties of Lyme Regis and Charmouth” in 1856 which describes him as a Draper, Grocer, and Lodging House Keeper”. He was no doubt making good use of the 5 bedrooms that went with the property. Sadly the 1861 Census reveals he is now a Widower living with his sister in law. His own death was to come just four years later, and the business was once more up for sale. We do have an amazing record of Edward that has come down to us in a rare photograph taken of him standing outside his shop before 1865. We can date it from the fact that the earlier building where the Court stands today can be seen lower down the Street and this was demolished in that year. 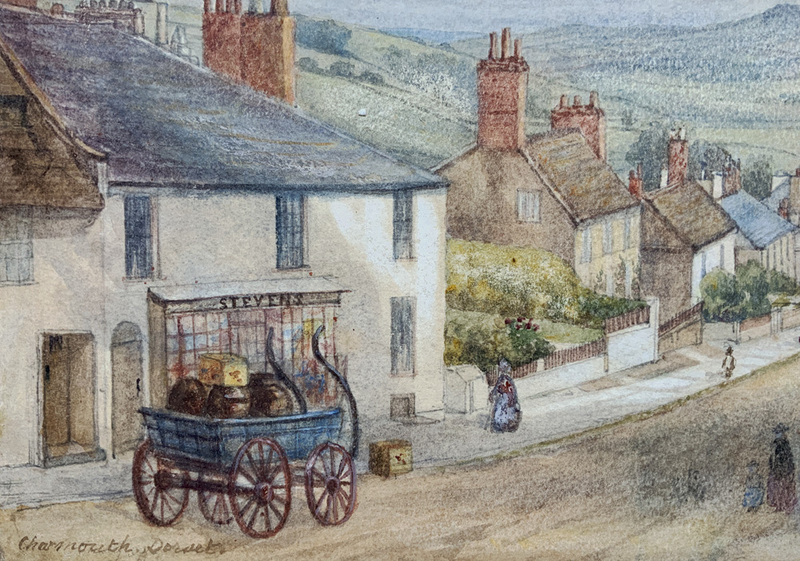 It is John Stevens aged just 26 from Beaminster who next takes on running the business and again we have a record of how his shop looked as I recently purchased a beautiful watercolour of the village with his shop at the top which is seen here. His name is emblazoned above the front and no doubt the wagon is delivering supplies to him. The 1871 Census has him and his wife, Elizabeth living with three step children in Portland House. An advert from the time has him running a “Family Boarding and Lodging House, replete with every comfort” from the premises. His was not to be a happy life there for he was to die soon after and leave us this sad epitaph. An Advert appears soon after “For sale Mahogany atop a counter, Grocers Coffee Mill, set of drawers, will suit a grocers Apply Portland House, Charmouth”. Without seeing the Deeds, I would have missed out completely the emergence of George Mortimer`s part in the story of the house. It would appear that he took on the lease of the shop soon after the death of John Stevens. 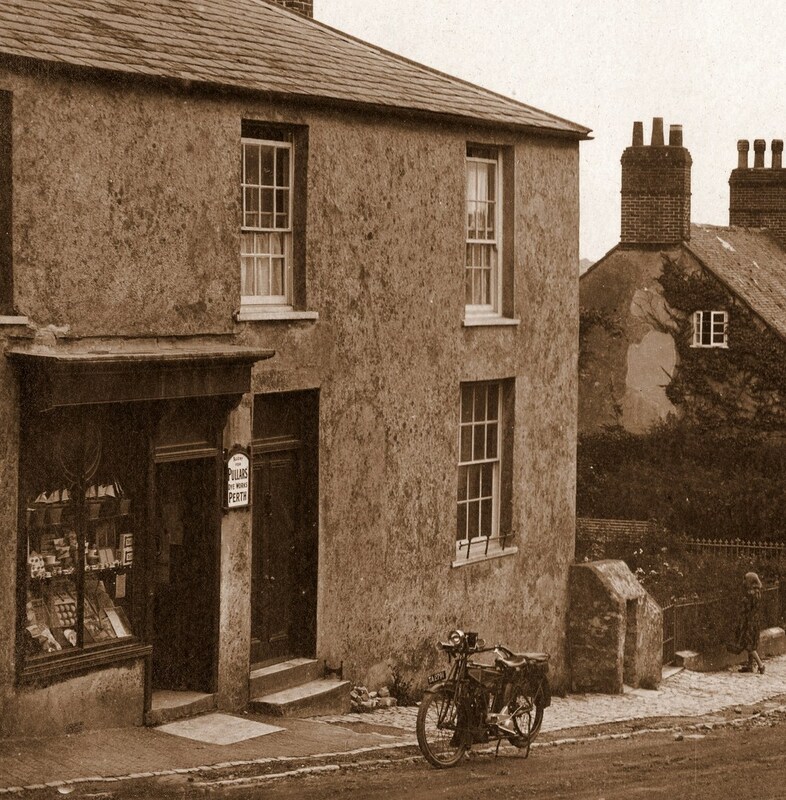 He had already purchased the freehold of its competition – Charmouth Stores (now Nisa) in 1876 and for awhile ran both enterprises. His opportunity arose in 1881 to buy the freehold of Portland House from the Knights. 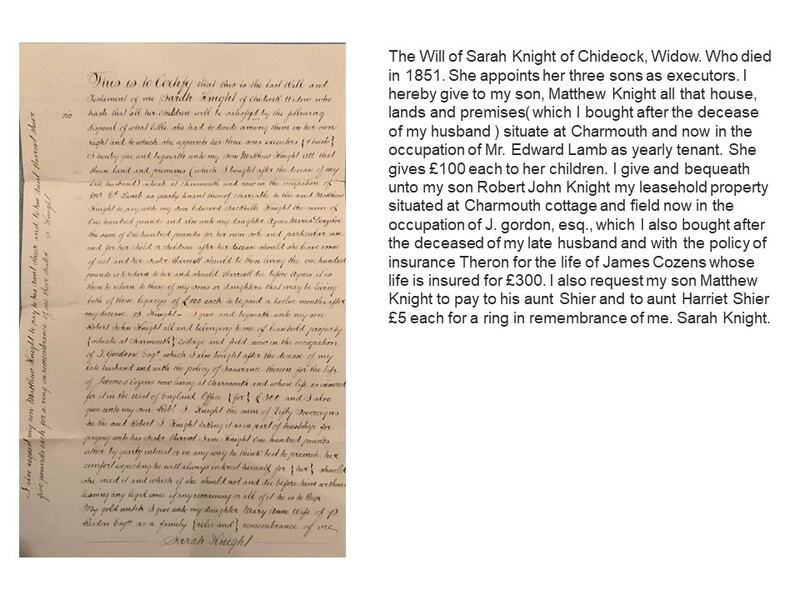 On the death of Sarah Knight in 1851, aged 75, it had been inherited by her son, Matthew who continued to live in their house in Chideock. He died in 1881 and left it to his brother, Edward, who soon after placed it for sale when it was bought by Mortimer for £420. He was there only briefly and sold it to Thomas Tarr for £450, making a small profit and moved from the district to Earls Court in London where he set up a larger Grocery Store. Thomas Tarr was living in Melbourne House at the time, which is on the opposite side. He had been Valet to Squire Gordon of Middleton Court, Somerset and was afterwards in service with his nieces, Misses Short who inherited Charmouth House. He bought Portland House with the intention of retiring there and employing his two unmarried daughters in the shop as Dress makers. The 1881 Census records that he was aged 66 and living there with his wife, Ann aged 64 and daughters Elizabeth, aged 29 and Jane aged 27. Twenty years later Elizabeth is now living with Miss Alice Enoch, aged 24 an assistant school mistress. We are very lucky as we can see how they looked as a photograph of their time there has come down to us with them standing proudly outside Portland House. You will also see that the Shop front had been reduced by then, no doubt to add a further door to allow access to the back. When her younger sister died Miss Elizabeth Tarr changed the business to Newsagents and Fancy Toy shop. 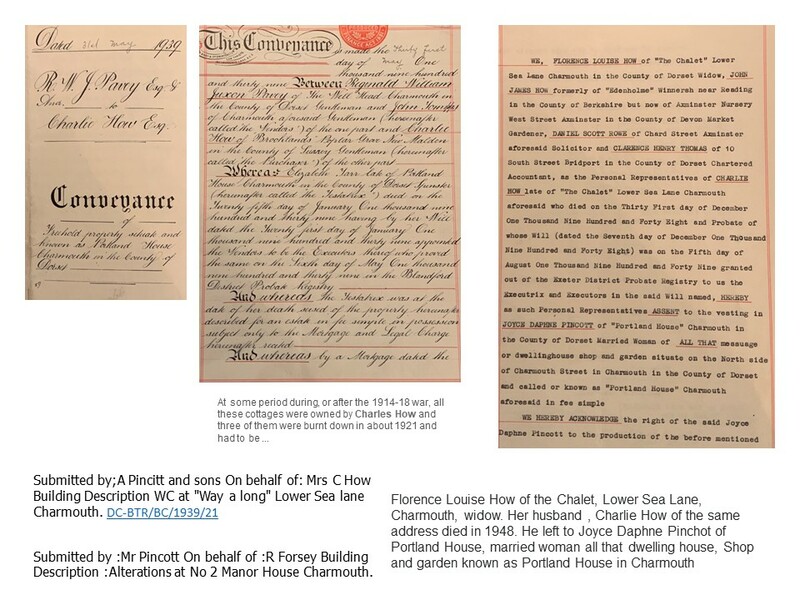 Elizabeth was to spend over 60 years at Portland House and Reginald Pavey mentions that after her death in 1939 he had the job of sorting it out and found stacks of old newspapers piled high there which were never returned. I always find it difficult to record the more recent history of a building as the people who occupy them are more mobile nowadays and the only way of finding out is through the Electoral Rolls which are very difficult to access. 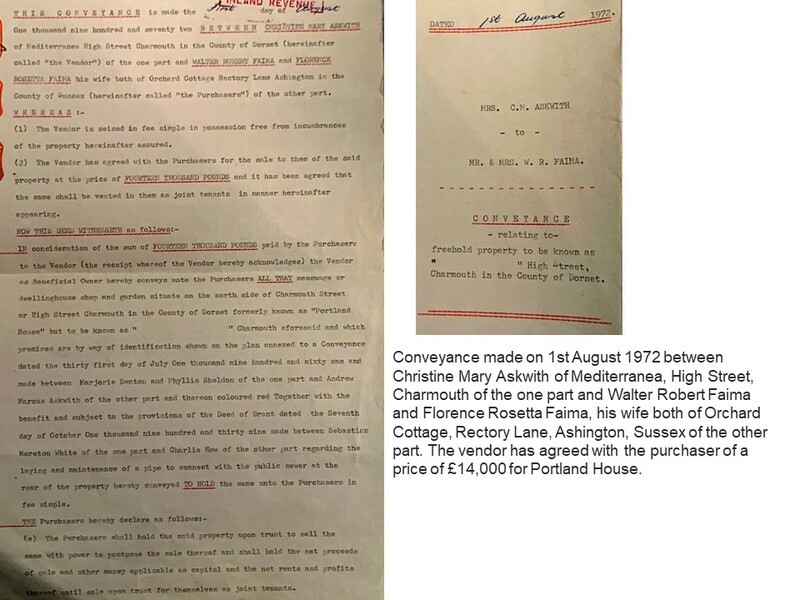 Fortunately, this was not the case with Portland House as David & Sheena Mandy had an almost complete record up until they purchased it in 1982. From these I have been able to bring the story of the house almost up to date. 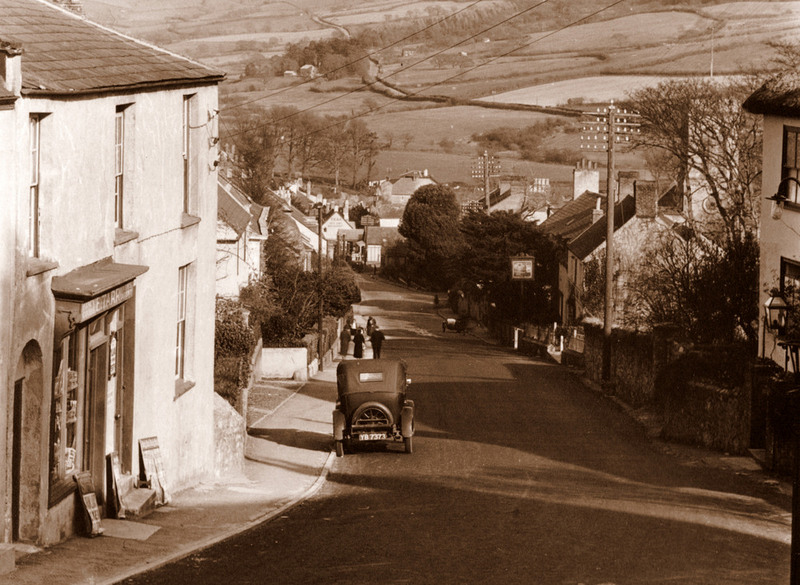 After Elizabeth Tarr died in 1939, aged 89, in Charmouth, it was the famous historian Reginald Pavey who was the trustee of her estate and sold it to a local builder, Charlie How. He paid £775 for the freehold and a portion of this went to the bank as Elizabeth had a large mortgage on it. 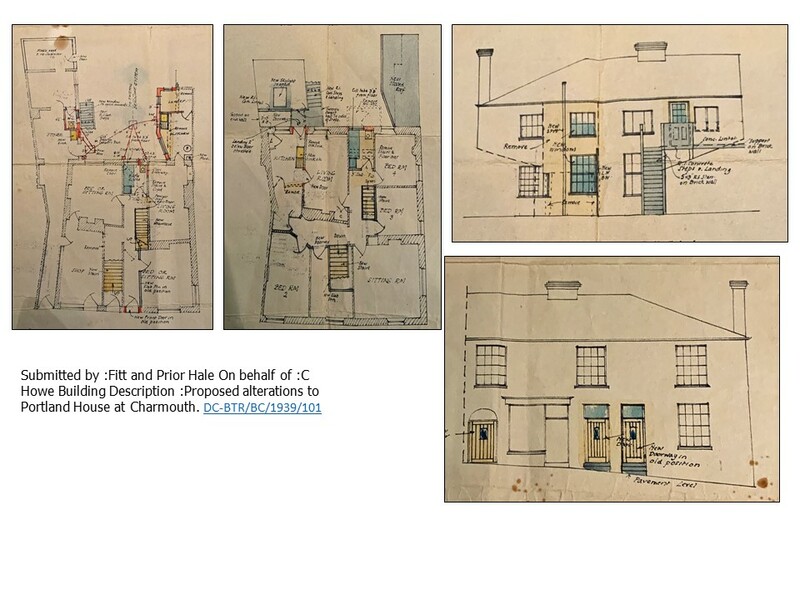 The original plans that he submitted to the council have survived and reveal a number of alterations and additions to the house. The most prominent was the reduction of the shop front to incorporate a door to Garden Cottage. He and his wife lived in the Chalet in Lower Sea Lane and rented out the house. He leaves the building to his daughter, Joyce Pincot, who is described as a hairdresser living there. 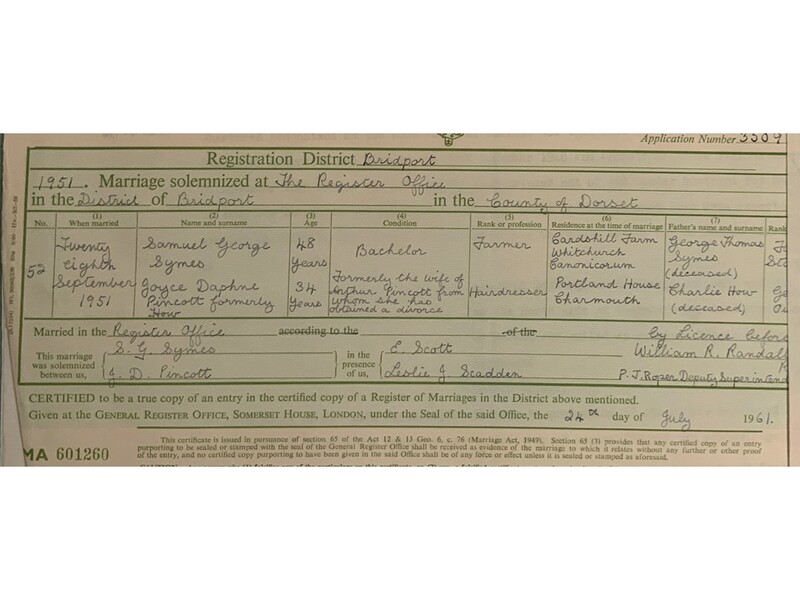 She is divorced and in 1951 remarries Samuel Symes, a farmer from Whitchurch. Soon after the house is put up for sale and bought by Marjorie Denton, Phyllis Sheldon and Claudia Sheldon from Warrington who pay £3500 for it. Tragically Claudia Sheldon, aged 70, is killed when a run away Lorry crushes her in Lyme Regis. No doubt as a result of their loss the others place the building once more up for sale. Good Parking 50 yards down Higher Sea Lane - opposite Shop. Mediterranea specialises in colourful and unusual Mediterranean wear and wares including clothes, hats, leather work, furniture, furnishings, basketry, wrought iron, rugs, pottery, glass, jewellery, musical tos - from all around the Mediterranean, including Greece, Italy, Malta, Morocco and Spain. For the benefit of country lovers and visitors. Mediterranea also include on their premises a country ways display with information, maps, brochures, etc, of Local Walks, Golden Cap Estate, National Trust properties, Country Interests”. Unfortunately, Andrew was to die in 1968 and Christine carried on for a while before selling it four years later to Walter & Florence Faima who were to pay £14,000 for it. They let the shop as a Hairdressers called “Suzannes” and had two holiday flats within it. Finally, in 1982 David & Sheena Mandy buy Portland House and in 1996 sell the two flats off and continue to live in Garden Cottage at the rear of the property. I wish to thank David and Sheena Mandy and Peter Crowter who live in the house today for their invaluable assistance in supplying information about their house. 1754 John Anning John Anning His name apperas on Porr Rates List for village owning a house. 1813 Robert Knight Harriet Edmonds 1813 census shows Mrs. Harriet Edmonds living there with her two daughters. 1823 Robert Knight James and Maryanne Collier Daniel Osmond (5 1/2d)Powell (3/6d) Collier (4/3d). Daniel is a school teacher. 1824 Robert Knight Joseph Cozens Joseph Cozens paying 4d poor rates for a house and garden from Robert Knight. 1845 Sarah Knight Edward Lamb Jury List as Grocer and Draper. 1851 Sarah Knight Edward Lamb census aged 51 wife is sarah aged 50 caroline Payne is sister-in law aged 45 assistant. 1852 Matthew Knight Edward Lamb Sarah Knight dies, aged 75 buried with her husband at Symondsbury. 1882 George Mortimer Hayward/Potter George rents out the shop to Hayward and Potter. 1939 Charlie How Charlie How He pays £775 for Portland House, but Miss Tarr had a large mortgage on it. 1939 Charlie How Charlie How Charlie How submits detailed plans for changes in Portland House inside and out. 1968 Christine Askwith Christine Askwith - Mediterranea Andrew Askwith dies. An Indenture for 1809 between George Webber, late of Charmouth in the county of Dorset, sailcloth maker, but now of Chideock. On the one part and John Symes of Bridport on the other part for the consideration of five shillings does sell that close of meadow or pasture known by the name of Grange Close containing one acre more or less in Charmouth in the tenure of James Warden afterwards of Elizabeth Newell Warden, his widow who he purchased it from together with all the outhouses. Signed George Webber. The 1841 Tithe Map shows Portland House as no.71 (22r 71p)with its original burgage plot stretching to the north boundary wall erected by the monks of Forde Abbey. In 1297 The Abbot of Forde who owned the Village of Charmouth decided to create a Borough out of it. The original document has survived and forms part of a Cartulary kept at Forde Abbey. It records " Those wishing to build within these bounds plots measuring 4 perches by 20 perches, by the view of the monks' bailiff, rendering 6d a year for each burgage in equal portions at Michaelmas and Easter ". 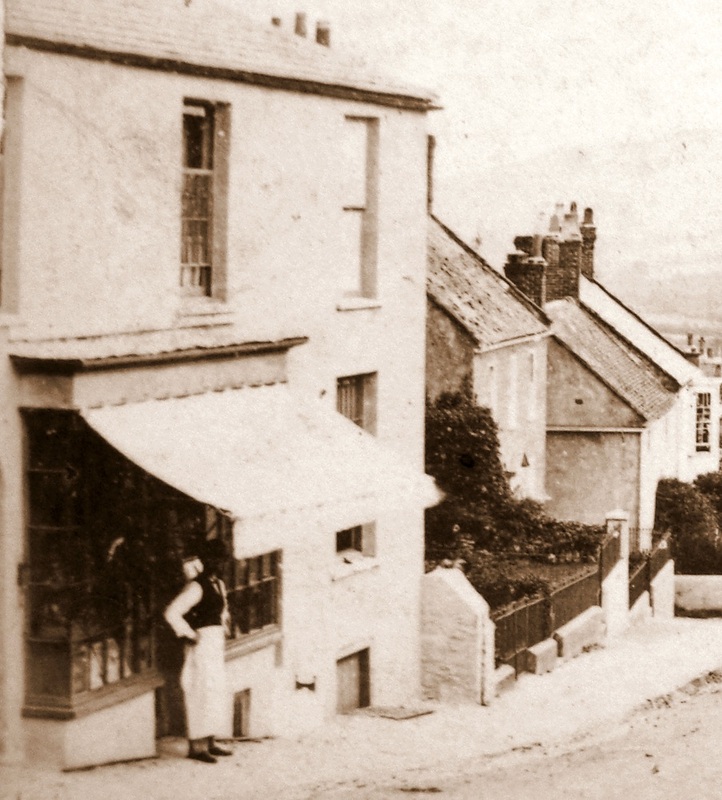 Joseph Cozens is shown renting the plot from Sarah Knight and is described as a Grocer and Tea Dealer in the 1830 and 1844 Directory for Charmouth. He also appears on the 1838 Jury List as a Grocer. He is also renting Foxley Farm which is bounded by Old Lyme Hill and Higher Sea Lane from George Darby. 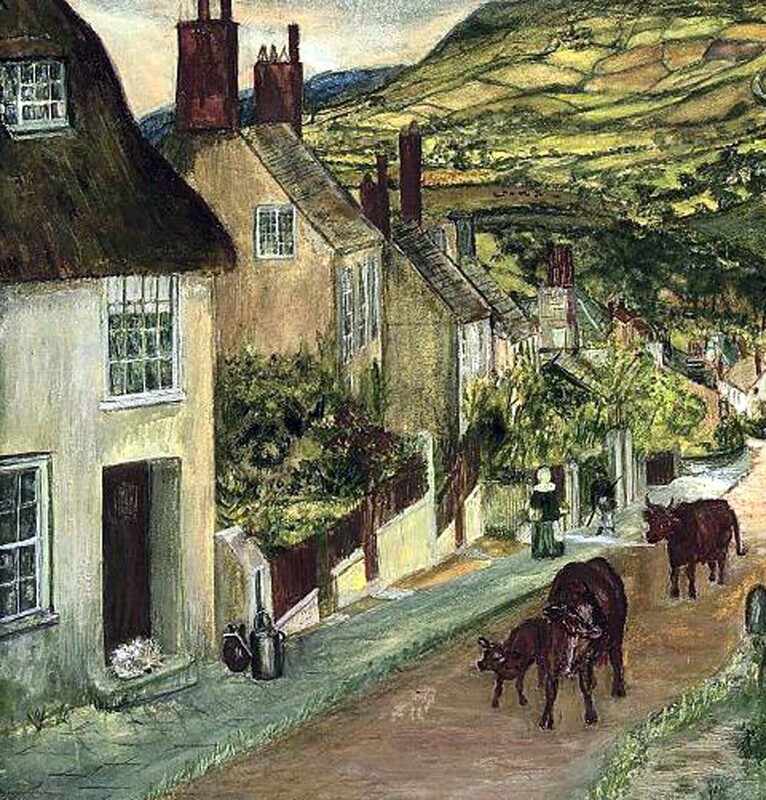 A section of the painting by Lucy Rossetti of Charmouth showing Portland House with a thatched roof on the left in 1879. She obviously used artistic license as the building represented is in fact Baybrook Cottage next to it, which was indeed thatched. George Mortimer is seen here in the doorway of his other Grocers which is now Nisa with his staff. He rented and later owned Portland House as well from 1879 until 1883, when he moved to London and opened a shop in earls Court. Portland House on the left with its name emblazoned above the shop front. It would seem that the crowd are posing for the photographer when this was taken c.1900. 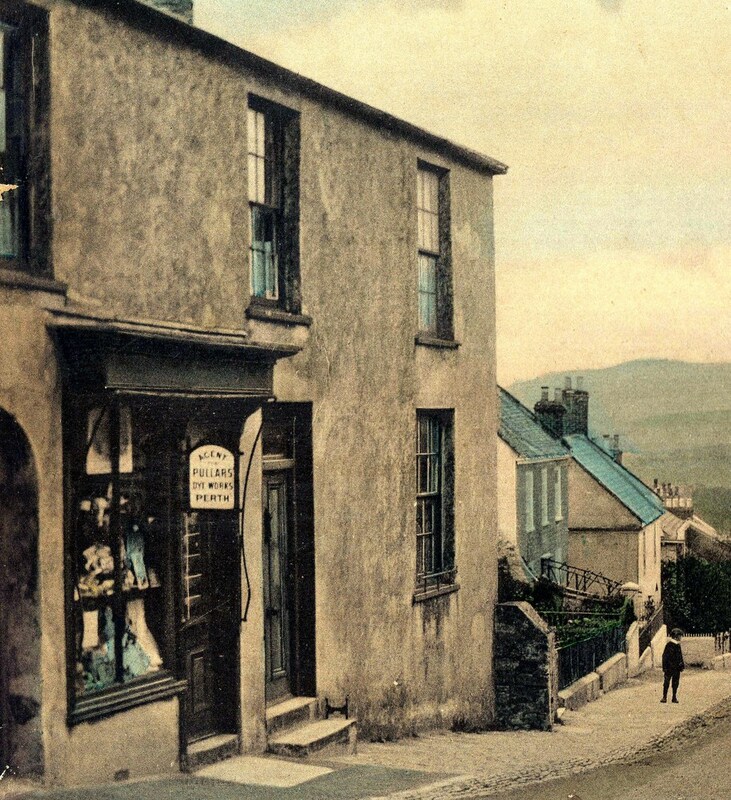 W. Barnes Bread and Cake shop on the left with Miss Tarr`s shop to the right of it about 1900. The Whittington sisters who lived in The Limes (Charmouth Lodge) are seen here inspecting a map, which they may well have bought from Miss Tarr in the Stanioners shop run by her for nearly 60 years. This photograph from victorian times shows Miss Tarr on the right in black and her companion, Miss Enoch in the white blouse in the centre, who was a school teacher. The sign details that Tarr`s was an Agent for Pullars Dye Works in Perth. This view of Portland House was taken in 1923 by Claud Hider from the upstairs window of Claremont.
" 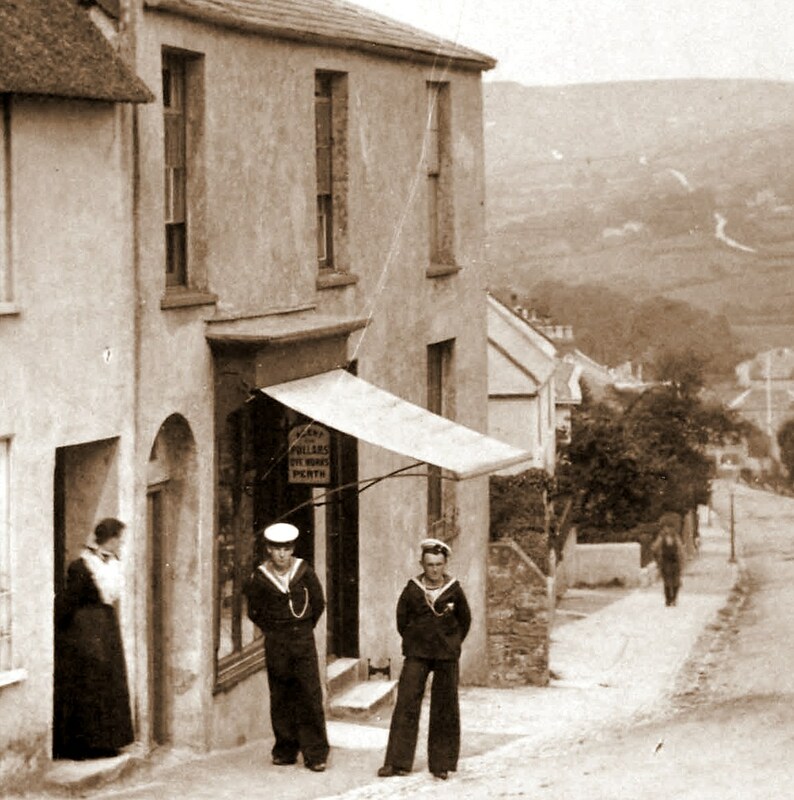 As you turn the corner of the street the shop in 1870 belonged to Wilson, a grocer. There is a cellar beneath the shop in which he kept his goods.A new and larger window has been put in lately, which is considerably lower, and the cellar door bricked up. One day Wilson had some plums for sale in a basket outside the shop. They presented a tempting sight or so thought a young boy named Fred Penny, who helped himself as he passed by. Wilson, unfortunately for Fred, saw the deed and was in wait for him on his return, Freddie continued his way home a sore and sadder boy" (Mr Penny used to relate this story with great gusto many years later). When Wilson left Thomas Tarr bought the house for his two daughters who were dressmakers. The younger daughter died and the other became a news paper agent, following Miss Welman of "Rupert House". She also sold toys and stationery. Enoch, infant school teacher, was one of many of Miss Tarr`s lodgers. Between the wars Miss Tarr was one of the personalities in the village. The comer was known as Miss Tarr` s Corner. She was a most regular churchgoer and staunch Conservative. She refused to sell "The Daily Herald" until the news agency threatened to stop her supplies. As she grew old her many friends became anxious about her until one morning in January 1939 it was noticed that she was not in the shop. Her companion, Miss Martin, was also old; both were found helpless in bed. Miss Tarr never recovered and died shortly afterwards and Miss Martin went to live with friends. The executors found the house in a marvellous state of dirt and discomfort. For years her unsold papers were never returned but thrown into a passage. Her demands for Income Tax returns were unanswered and littered the floor of her sitting room with many unopened letters. The drawers of the counter were lined with newspaper more than 20 years old. Old prints of Charmouth were found where they had been put many years ago. The contents of the shop were mostly out of date. The kitchen quite unusable and the scullery completely blocked with spiders` webs thickly coated with soot Upstairs many records of Charmouth known to Miss Tarr and her father came to light lying about, (especially those concerning Charmouth House, but her bedroom was beyond description. By the side of her bed were a candlestick and a pyramid of spent thrown down on the floor and never cleared. How she escaped a fire was a marvel. The attic above had not been cleaned for years. The floor was ankle-deep in paper; volumes of Mr. Tarr's diary, which proved to be uninteresting; handbills including the report of the village hospital already mentioned, and broken toys. It was a sad and depressing for those who cleared and cleaned the house and who had known Miss Tarr in former years. At the sale which followed the premises were bought by Charlie How, The house was converted into two flats and another staircase added by cutting off part of the shop; his daughter opened a lady's hairdresser establishment. It then became an Antique shop. 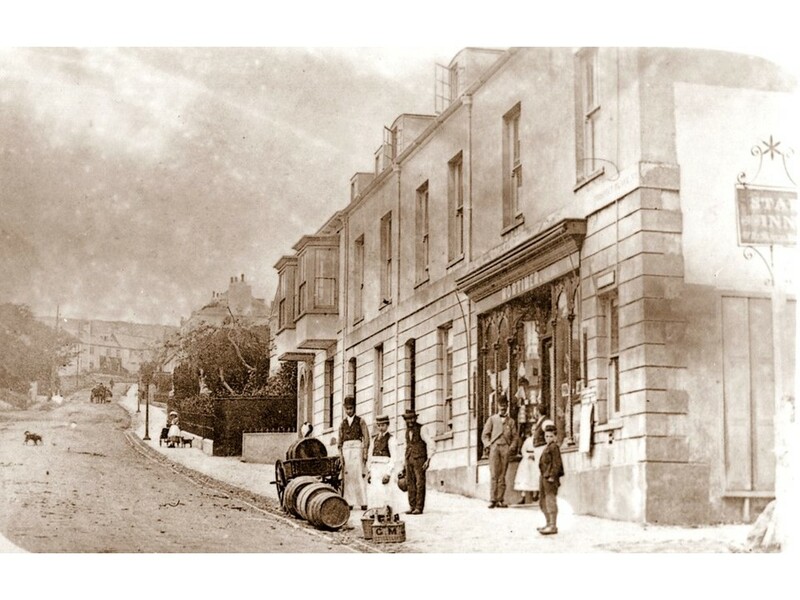 Unfortunately one of the owners was killed in Lyme by a runaway lorry and the premises were bought by Colonel A.M. Askwith, who opened it for the sale of fancy goods from the Mediterranean. It is interesting to note the step of the shop, the top of the Church Tower parapet and the of Stonebarrow farm are all the same level".